Mending Fences by Suzanne Woods Fisher is the latest book in The Deacon's Family series. My guilty pleasure is reading Amish fiction. I have been reading Suzanne's books for a few years now and have reviewed Phoebe's Light, The Return, and The Devoted. I have enjoyed each one of them! I received this book from Revell Books in exchange for my honest opinion. I truly fell in love with Izzy and Luke's stories. The world is a harsh place for many, and their stories reminded me that everyone has a backstory that isn't often seen. I love walking Luke's path with him as he made amends to all the people he had pranked in the past. I loved watching Luke seeing what his not-so-innocent pranks meant to the receiving end. He learned so much about empathy for others through the pages of the book. So did I.
I loved the interwoven lifestyle of the Amish stories. A chunk of the book was dedicated to Alice, whom Luke had put a snake in her buggy. Luke didn't know that Alice had a real fear of snakes and this prank caused Alice some deep anxiety about leaving her home. Through much diligence and time, Luke and his friend were able to help Alice overcome her fear of snakes and attend church for the first time in a couple of years. The book explores repentance, forgiveness, acceptance, grace, and being worthy of love. We hear about AA's 12 step recovery, grace, alcoholism, and drug abuse. We see broken families and child neglect. We watch God's Will blossom through his people. The characters are well defined and extremely likable. Each has their own flaws and works to understand and accept them. We see their day-to-day hearts and their personal struggles to let go of their plans and surrender to God's. I enjoyed this book so much that I finished it within 4 days, reading only at night! The plot is interesting and diverse, lots of stories to keep you interested, and enough twists to make you sit up straight! Even though some of the characters had done awful things to people, Suzanne makes these people human, not to be disliked. I appreciated that and give kudos to her for writing so well. I highly recommend this book, and many others by Suzanne Woods Fisher. If you are interested in purchasing this book, the link below will take you to Amazon and you can buy it there. If you use this link, I will get a small commission. Thanks in advance! I love Amish fiction and this sounds like a really good read. I think I will head to Amazon. I enjoy reading Amish books and find them always uplifting and spiritual. Sure the characters has their problems but it is always a happy ending. This sounds like a book I would enjoy. Reading is one of my favorite things to do, so I'll add this to my list for sure. This looks like a interesting book and since I just finished the one I was reading I will see if I can purchase this one. Which will give me a new author to learn about. Oh man, if only I had any time to read!! How are you doing? Hoping you are doing great!! This is my first time learning of this book. It sounds like a great read. I have to make sure to add this to my reading list. This sounds like an interesting book. 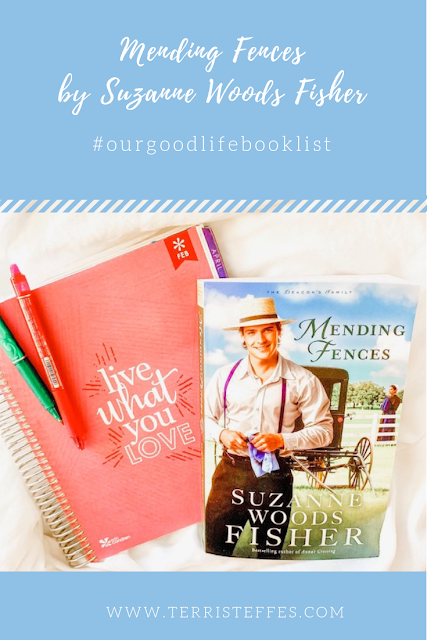 I love reading but have never read Amish fiction before. I am always looking for new books to read so thanks for the suggestion! I confess I didn't know there was an Amish fiction genre. I can imagine it adds some different nuances to the lives in the book. It sounds like this book also has some nice themes. Thanks for the recommendation! I just love them. (the Amish books) They show the Amish lifestyle, their reasons for doing the things they do, their love of cooking and nature. I love this "Every saint has a past. Every sinner has a future." Looks like a great book to read. This book sounds super intriguing. I have yet to read any type of Amish fiction but I think I would really enjoy it. This sounds like a really good book for me to dive into. I need to start reading more books on a regular basis. Have to add this to my book bucket list. I didn't know that Amish fiction was even a thing. It sounds like an interesting story. Every time I read about a new book I wish I could add an extra hour to my day. I really miss having the time to read. My mother in law really likes Amish fiction books. This sounds like one she would really enjoy reading. Mending Fences seems to be a nice story! Perfect for a relaxing Sunday afternoon! Never read a book by this author before. But this sounds like a good book to read. Will have to check it out. wow, sounds like a very interesting book to read. I've been wanting to read amish fiction books. Would love to check it out. Thanks for sharing! Looks like this book would be a great read. My family is going to Pennsylvania in a few months and one of the top things on our list is going to visit the Amish country. Their lifestyle fasinates me! Sounds like a great read! I just finished Becoming by Michelle Obama and I need a new book to read. Thanks for the recco!